McDonald's is directly found on Derby Road, approximately a 1.14 mile distance north-east from the centre of Burton On Trent (near Beech Hotel). The restaurant provides service primarily to the districts of Rolleston On Dove, Shobnall, Stretton, Burton-On-Trent, Winshill, Horninglow, Newton Solney and Dalbury. It offers 24 hour service today (Thursday). Please see this page for more information regarding McDonald's Burton On Trent, Derby Road, including the hours of operation, address or direct number. You can visit McDonald's in the vicinity of the crossroads of Jackson Avenue and Derby Road, in Burton On Trent, Derbyshire. The restaurant is ideally located a 1 minute drive time from Beech Avenue, Kingsmead, Lapley Drive or Beech Lane; a 4 minute drive from Main Street, Bridge Street and Hawkins Lane; and a 10 minute trip from A38 or Horninglow Road North. For motorists using route planners the postcode is DE13 0BB. You can find bus stops in walking distance from the restaurant, at Stretton Retail Park, Beech Hotel, Meadow Lane and Hillfield Lane. The train arrives at Burton-On-Trent Station (1.93 mi away). You can take the line: East Midlands Trains. Within a couple miles there is Pirelli Stadium, Bitham Lane Community Park, Horninglow Linear Park, Pirelli Industrial, Eton Park Junior School and Claymills Pumping Engines. There is currently a total number of 3 McDonald's locations operating in Burton On Trent, Derbyshire. 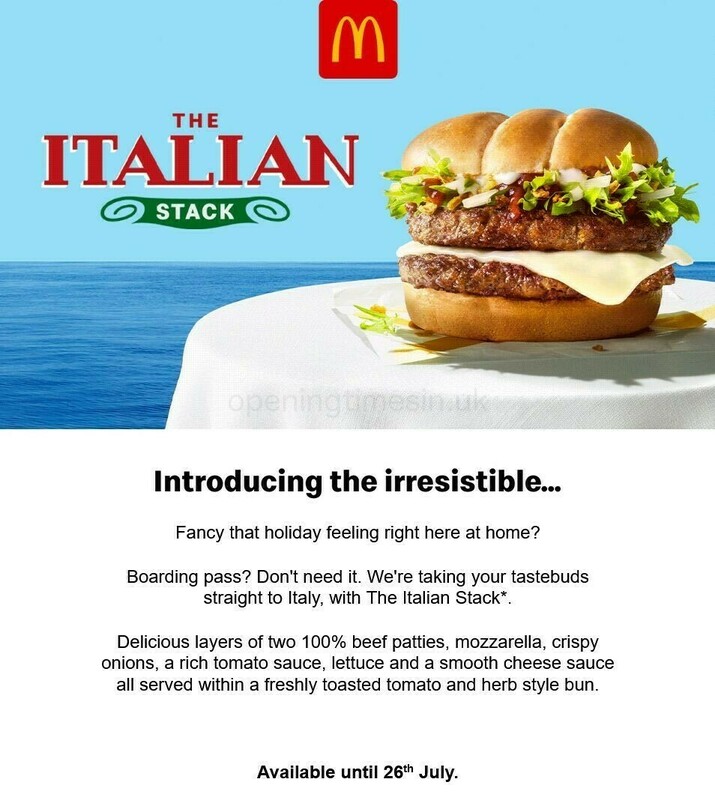 Visit this link for McDonald's branches near Burton On Trent. Please note: public holidays may result in alterations to the regular business hours for McDonald's in Burton On Trent, Derby Road. In 2019 these updates involve Xmas, New Year's, Easter Monday or Bank Holidays. For verified information about the holiday working times for McDonald's Burton On Trent, Derby Road, visit the official website or call the customer service line at 370 524 4622. Opening Times in the UK is always striving to supply you with the most up-to-date information. If you found any discrepancies or errors in the place of business address or business times for McDonald's in Burton On Trent, Derby Road, please use this form to report a problem. Your comments are helpful. Please use the form and star ranking scale below, to rate McDonald's.